Random Harvest (1942) is a romantic drama directed by Mervyn LeRoy that was a hit at the box office and received seven Oscar (US Academy Award) nominations (for Best Picture, Best Director, Best Actor, Best Supporting Actress, Best Screenplay, Best Score, and Best Art Direction). The film was based on the best-selling 1941 novel of the same name by James Hilton, two earlier best-selling novels of whose had also been made into highly popular films – Lost Horizon (novel - 1933, film version - 1937) and Goodbye, Mr. Chips (novel - 1934, film version - 1939). A common feature of Hilton’s romantic stories is the depiction of a protagonist in search of sustained bliss who allows mundane concerns to distract him from recognizing that the path to his goal has been right there in front of him all the time. This is the poignant theme of Random Harvest, too. The story of this film concerns a shell-shocked soldier from World War I who is suffering from amnesia. He is physically okay, but he doesn’t know who he is. There are some implausible elements to this narrative, but it does concern a basic truth about all of us: our self-conceptions are built out of the narratives we construct about ourselves and that are held in our memories. If you don’t know anything about the story of Random Harvest and are thinking of reading the novel, I suggest you stop reading this review after this paragraph and read the novel first (as I happened to do). This is because the novel contains a major plot element that leads to a dramatic twist at the end of the story, which is key to the novel’s special appeal. Although the film is enjoyable, its narrative presentation doesn’t have this twist and suffers accordingly. Charles Ranier is the scion of a wealthy and well-connected English family with major business interests. He goes off to fight the Germans in World War I, suffers a traumatic injury in 1917 that causes him to lose his memory, and winds up in a mental institution not knowing who he is. “John Smith”, aka “Smithy”, is the name given to the amnesiac in the mental hospital. Upon the occasion of the armistice in 1918, the chaotic celebrations of the hospital staff enable Smithy to walk out of the front gate unnoticed and start a new life. He is befriended by a musical-hall dancer known as Paula Ridgeway (Greer Garson), who shields him from the authorities. They run off to the anonymity of the countryside, fall in love, and get married. Smithy doesn’t know anything about his past prior to 1917. Smithy and Paula are enjoying a blissful life and madly in love. Smithy gradually evinces a talent for writing and in 1920 gets an offer from a newspaper publisher in Liverpool to come there to be interviewed for a position. He travels to Liverpool alone, because Paula is looking after their newborn child. When he arrives in Liverpool, though, he is hit by a taxi on the street and suffers another traumatic head injury. When Smithy wakes up in a hospital, he has recovered his memory of being Charles Ranier, but has forgotten all about his existence as Smithy, including his memory and awareness of his beloved Paula. The romantic Smithy has disappeared. He is now Charles Ranier once again, but with a three-year gap in his memory. The now-rehabilitated Charles returns to the Ranier estate and learns that his father has just died and that he is to come into a substantial inheritance. Although Charles had wanted to resume his academic pursuits, he discovers that the family estate’s business assets are in disarray, and he takes over their management. After a few years, Charles’s business activities are so successful that newspapers are touting him as the “Industrial Prince of England”. Although his teenage step-niece Kitty (Susan Peters) develops a crush on him, Charles’s business activities take up all his time, and he doesn’t seem interested in romance. The many businesses that he has to deal with require a competent support staff, though, and over the years Charles has come to increasingly rely on his executive assistant, Margaret Hanson. 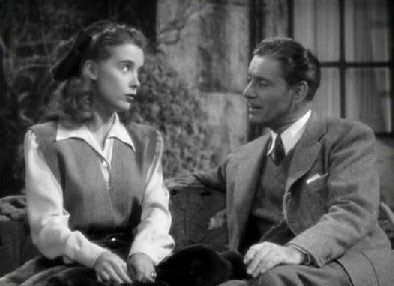 When Margaret finally appears on screen, we see that she is his Paula (“Paula Ridgeway” had been her stage name), though Charles doesn’t recognize her. She had been searching for Smithy since he had disappeared, and when she saw Ranier’s picture in the newspaper, she had applied to become his secretary. But partly on the advice of a doctor friend, she didn’t want to inform the still-amnesic Charles about her being his wife, thinking he would reject her. She is still hoping that Charles will eventually recognize her as his lost love. But Charles doesn’t seem to have a trace of memory of her. He does often have a distracted look in his eye, though, as if he looking for something that he can’t find. The still-enamored Kitty notices his distracted demeanor, and she finally gives up on her long quest to marry Charles. Margaret hasn’t given up though, and when one time Charles goes to Liverpool to learn what he was doing there when he suffered the head injury, she joins him. But it all comes to nothing; Charles cannot remember anything of that day. Charles becomes increasingly successful in the outer world, and he even wins a seat in Parliament. Now more in the public eye, he decides he should have a wife, and he proposes to Margaret that they have a passionless marriage of convenience. Still keeping her secret, Margaret sorrowfully accepts. After three years of this lifeless marriage, Margaret despairs of ever regaining her Smithy, and she tells Ranier that she is going to go off on an extended trip abroad. Just before she can leave, though, some events transpire to turn things around. A labor dispute involving one of his companies, causes Ranier to visit the town where he had been confined in a mental institution. Trace recollections start occurring for him, and as he follows their lead, he eventually finds himself coming upon the countryside cottage where he had lived with Paula. A chance remark from an innkeeper also leads Margaret to return to the same cottage. When they see each other and she calls him Smithy, Ranier’s full memory of Paula returns. They passionately embrace as the film ends. Hilton’s story in Random Harvest of paradise lost and paradise regained can be told in more than one way, and the novel and the film take different perspectives and unwind according to different temporal patterns (using flashbacks, for example). The novel takes the perspective mostly of Smithy/Ranier, and the reader follows his search for fulfillment. The reader only learns that Ranier’s wife is actually Paula on the last page of the novel, and this delivers a concluding dramatic wallop. That narrative avenue would have been extremely difficult to follow for the filmmakers, so they chose a different scheme. For much of the film, the viewer sees things more from the perspective of Paula/Margaret, and this has its own virtues. 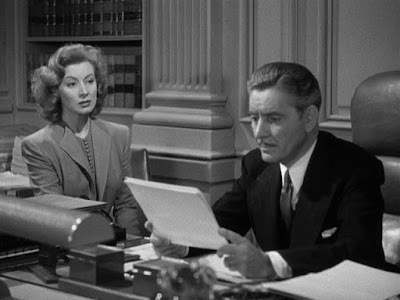 In particular, the glowing performance of Greer Garson in that role is what carries the film. In fact I found the performance of Ronald Colman, who can often be fascinating, to be on this occasion too laid-back and sometimes almost wooden. 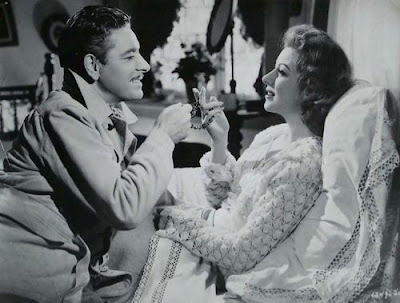 It is left to Greer Garson to inject warmth and romantic longing into this tale. Even her glances at Colman carry an authentic aura of true love.